Saffron Road is expanding its plant-based protein snack line with the addition of ChickBean Crisps – a baked snack made with high-protein lentils, yellow peas, garbanzo (chickpea) and sweet potato flours. ChickBean Crisps are free from artificial flavors, colors, and preservatives and since they’re primarily made from legumes, each one ounce serving of Saffron Road ChickBean Crisps contains four grams of protein, two grams of fiber and only a few grams of fat. Initially, they come in three flavors, Sea Salt, White Cheddar, Zesty Ranch, and all are certified Halal, OU Kosher, and Gluten Free. Additionally, these new Crisps are soy free and are in the process of being Non-GMO Project Verified. 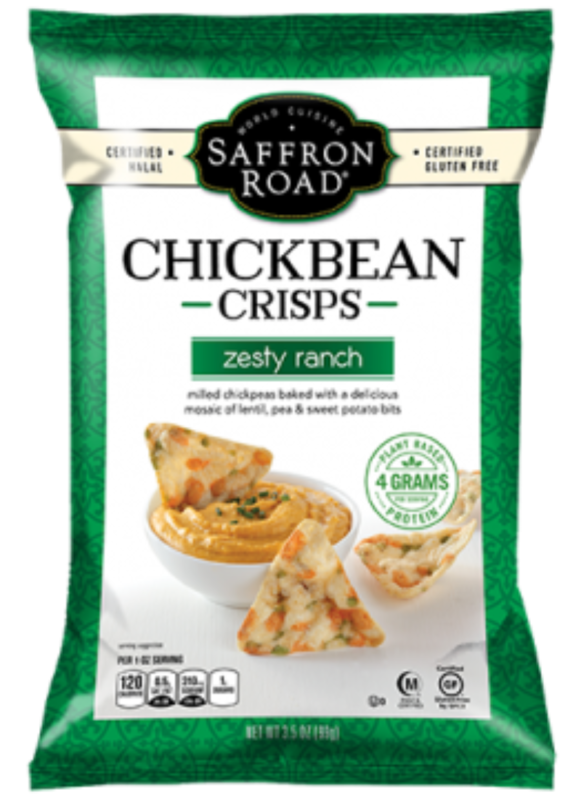 “Saffron Road’s new ChickBean Crisps are right on trend for today’s snack consumer. Their low-fat, protein rich, high fiber attributes are the perfect on-the-go snacking option.” says Jack Acree, executive vice president of Saffron Road. The ChickBean Crisps are launching nationally this month and will initially be available at Whole Foods Market for the suggested retail price of $3.99.